Maricopa County officials will subpoena records that Sheriff Joe Arpaio’s office has refused to turn over to U.S. Department of Justice lawyers who are investigating the police agency over allegations of discrimination and unconstitutional searches. County spokeswoman Cari Gerchick said Friday that the move is aimed at keeping federal authorities from possibly taking away some or all of the federal funds that the county receives annually. The nearly $113 million that the county received last year from Washington accounted for about 5 percent of the county’s $2 billion budget. “We don’t want any program jeopardized because one part of the county isn’t cooperating with a lawful investigation,” Gerchick said. The Justice Department has been investigating Arpaio’s office since March 2009 for accusations of discrimination, unconstitutional searches and seizures, and having an English-only policy in his jails that discriminates against people with limited English skills. Arpaio believes the inquiry is focused on his immigration efforts. His office had no immediate comment at midday Friday. The Justice Department declined to comment. Ten days ago, the Justice Department threatened to sue Arpaio’s office if it doesn’t turn over the records by Tuesday. The federal lawyer who made the lawsuit threat didn’t explicitly say the agency was considering taking away some or all of the federal funds for failing to turn over the records, but he emphasized that agencies receiving federal funding are required to give Washington access to the information. Losing federal funding is a possibility if the Department of Justice concludes the police agency had taken discriminatory actions and refused to remedy them. Robert Driscoll, a lawyer for Arpaio’s office, told the Justice Department that the threat to sue over records was premature because his client is willing to cooperate with certain elements of the probe. Driscoll had said Arpaio fully cooperated in the jail inquiry but won’t hand over additional documents in the examination into the unconstitutional search allegations because federal authorities won’t say exactly what they are investigating. 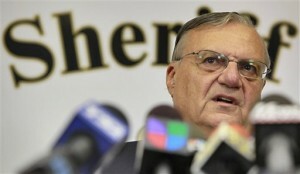 County officials and Arpaio have been embroiled in a dispute over the last two years. Arpaio has investigated members of the Board of Supervisors and some county managers in what he described as a necessary effort to rid the county of corruption. County officials say Arpaio has brought baseless investigations against officials that have collapsed in court.